It’s shaping up as a technological battle royale, but the fight between electronic whiteboards and projectors could determine how a generation of college students are taught. Think of the conflict as a cage match in five rounds, where their positives and negatives are pitted against each other. In this corner, we have the old champ: the traditional classroom projector, which does a good job of putting readable text and images onto a screen, and prices have never been lower. In other words, it carries the weight of video-based teaching in classrooms and lecture halls. In the other corner is the upstart: large interactive displays or whiteboards. They are expensive, but allow an extra level of interactivity and never cast a shadow on the lesson. So – as they say – let’s get ready to rumble. There’re a lot of pre-fight preliminaries to deal with, such as the installation of the projector or whiteboard. To start, you’ll need to hang a projector from the ceiling, wall, table (including under-table), or nook. This can entail wiring, mounting hardware and often stand-along audio. Large LCD screens are no easier to deal with when it comes to set up, because they can be quite heavy. At 174-pounds, the 80-inch PN C805B Sharp Aquos Board can require three people to safely hang it. Needless to say, it also requires specialty mounting hardware and often in-wall wiring. 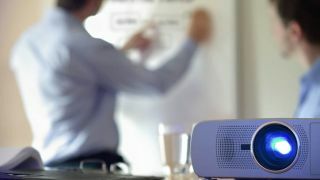 On the other hand, the Aquos Board’s pair of 10-watt speakers can fill up to a medium-sized classroom with sound. Both the InFocus JTouch 70-inch whiteboard and Casio XJ-L8300HN LED projector can show UHD 3,840 by 2,160 images. That’s roughly four-times the number of pixels as regular old HD imaging and is perfect for an art history, virtual-reality or experimental film class. After a long punch-fest, it’s a draw between interactive whiteboards when it comes to the ability to show details. Both whiteboards and interactive projectors can let the professor or a student write directly on the digital image, and they often include sophisticated software for creating, displaying and saving lessons. The difference comes when it’s time to touch the screen to select a program to run or highlight a physics graph. Here, whiteboards, like BenQ’s JamBoard, work with finger touch as well as digital pens. Short-throw interactive projectors like Epson’s BrightLink 697Ui are catching up. They can respond to as many as six fingers or its pair of included digital markers. On the downside, it requires a complicated laser unit to sense where the fingers are. No matter how you try to avoid it, projectors cast shadows when the teacher gets caught in its beam, plus there’re few things worse than being blinded by the projector’s light. Because whiteboards use liquid crystal display panels to create the image internally, there’s never a shadow to get in the way or make the teacher squint. When it comes to educational AV gear, price is often the object. Projectors are the established champ and a lot of that is because of their low price. For instance, the 70-inch Planar PS7050T whiteboard is twice as expensive as NEC’s U321Hi-WK interactive projector, yet they both deliver a sharp HD image that students and teachers can interact with. After the judges tabulate their scores, the decision is in and it’s a tie between touch whiteboards and projectors. They each have their technological pros and cons, but the upstart contender wants a rematch. As whiteboard technology matures and comes down in price it just might have the advantage over projectors the next time around, but the ultimate winners are teachers and students.